Chicken tenders are a household staple for our family when we are in a pinch. 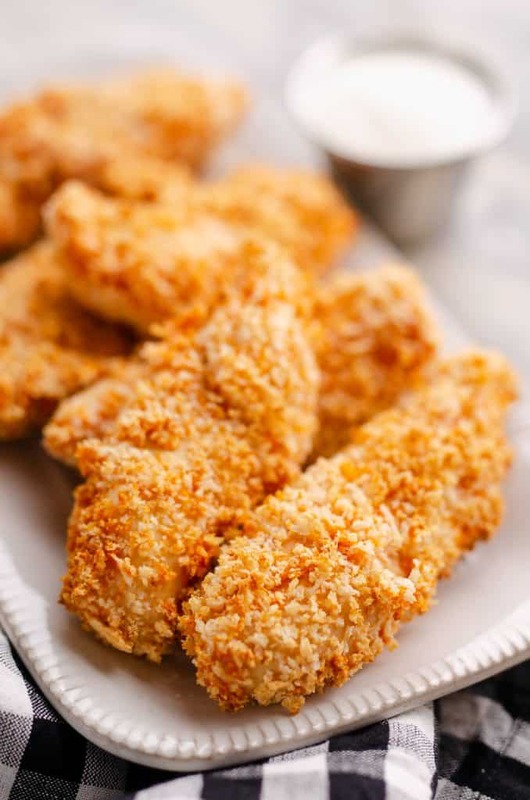 If we need a quick and simple dinner, we just toss some frozen chicken strips in our Airfryer. I usually enjoy them with a salad while my husband prefers the classic pairing of french fries. Now that we have two toddlers to feed, I prefer to give them as few processed foods as possible. This is why I made homemade Air Fryer Buffalo Chicken Tenders, so we could all enjoy the healthier option. The sodium in the buffalo sauce isn’t something I would normally give my kids, but an occasional treat is always nice. The heat from the sauce wasn’t an issue because they can already handle spice better than their father! There is something about cutting up raw chicken that just really doesn’t appeal to me. I don’t know what it is but I just do whatever possible to avoid the task. Therefore for these Air Fryer Chicken Tenders, I bought a pack of fresh chicken tenders that were already cut in the perfect size. If you don’t have that same aversion, you can certainly buy boneless skinless chicken breast and slice them into one inch thick tenders. 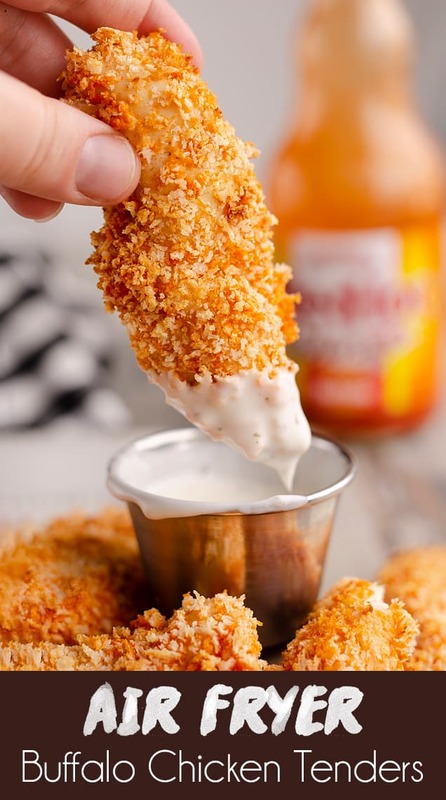 Set up a breading station with a bowl of buffalo sauce, a bowl of Panko breadcrumbs and your chicken tenders. Be sure to pat your chicken dry before starting or the sauce won’t coat the chicken much. The sauce is where all the flavor is at so that is a crucial step. 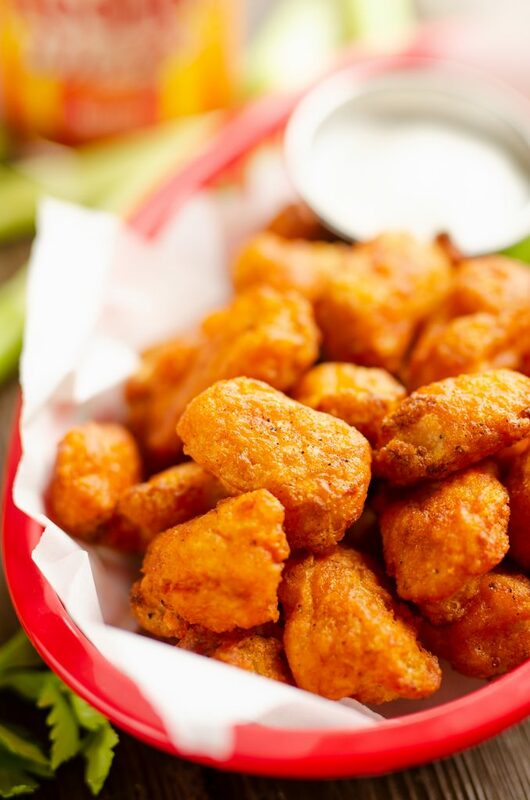 Dip each chicken tender into the buffalo sauce and using your fingers, wipe off any excess. 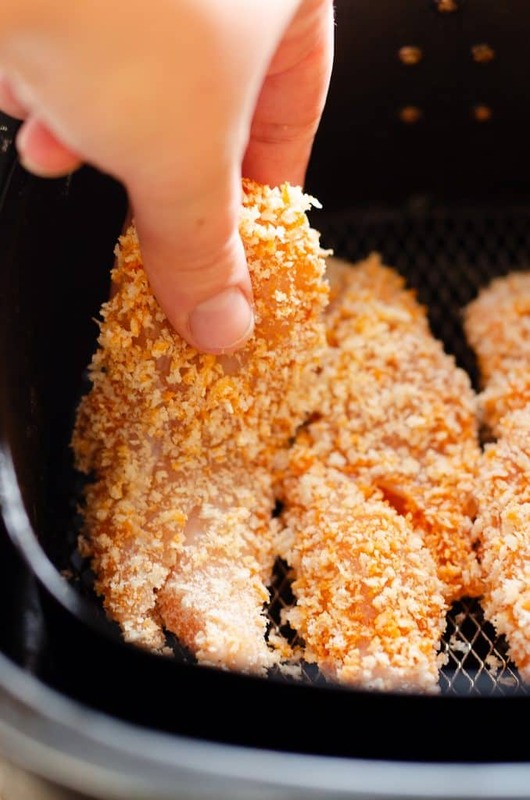 Roll the coated chicken in the Panko bread crumbs and carefully place in the Airfryer basket. 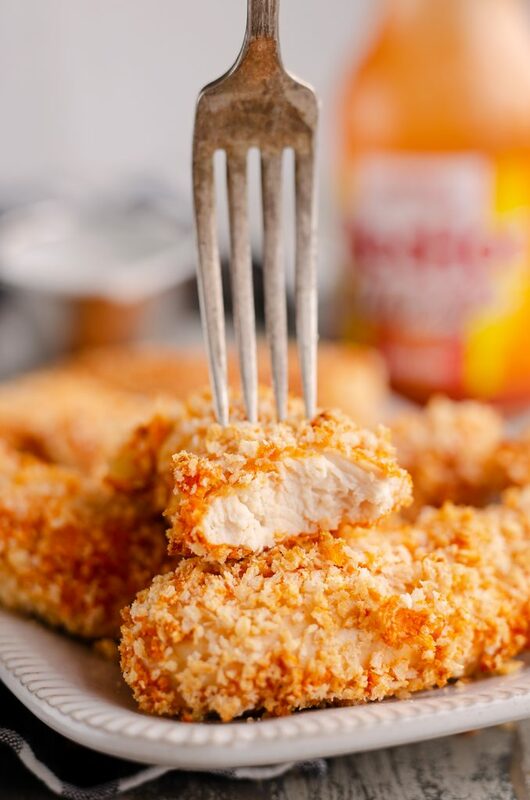 The cooking time for these Air Fryer Buffalo Chicken Tenders will vary slightly based on how thick you cut your chicken tenders. I cooked my chicken for 20 minutes and the meat was perfectly tender while the breading was wonderfully crispy. The best part about these chicken strips, which makes them healthier than their frozen counterparts, is the light breading. 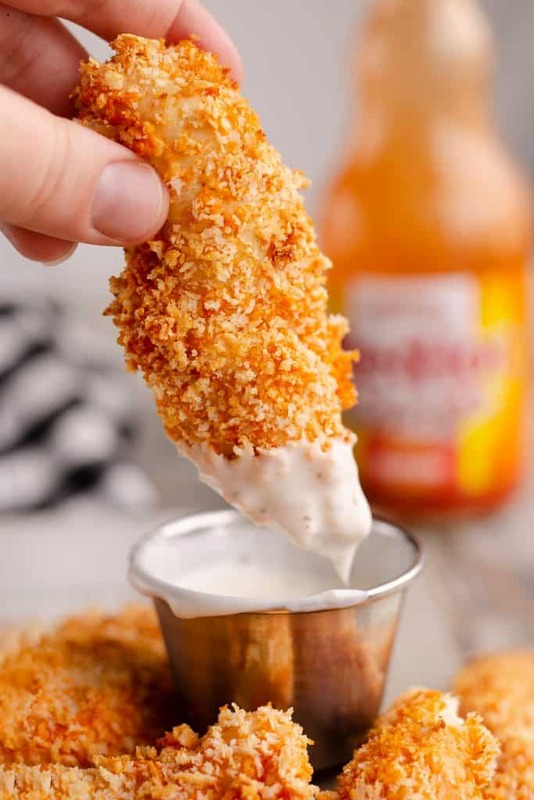 Instead of a thick coating of deep fried breading, these Air Fryer Buffalo Chicken Tenders have a light Panko breading which makes for a great low-carb recipe. 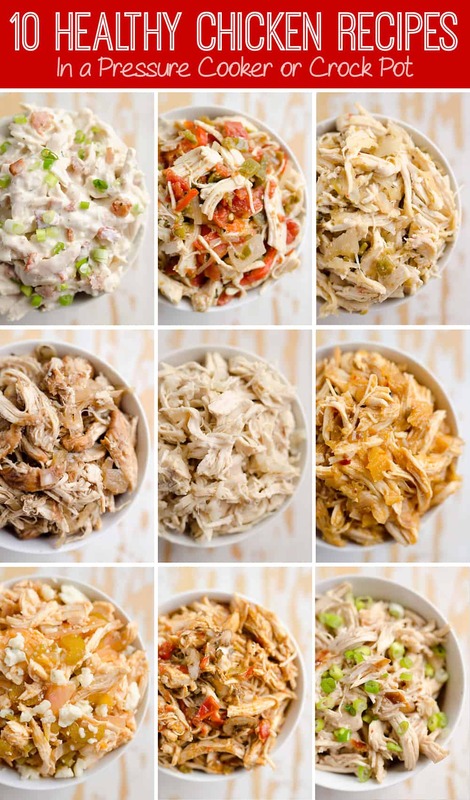 If you are looking for a more complete healthy meal, these would be fantastic on the Crispy Buffalo Chicken Salad. 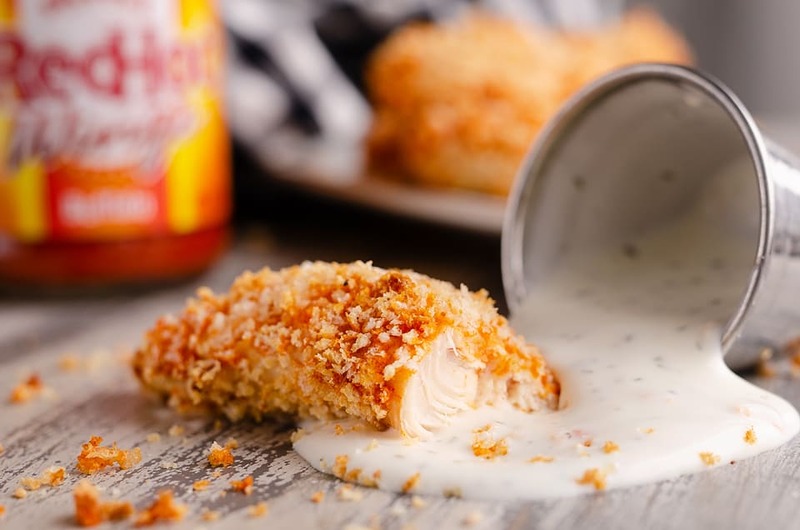 The crispy chicken strips paired with sharp white cheddar, fresh vegetables and a Light Bleu Cheese Dressing is a delicious combination of flavors and textures. Cut the chicken breasts into 1 inch thick strips. Pat the chicken dry with a paper towel. Pour the buffalo sauce into a small bowl. Add the Panko breadcrumbs to a seperate small bowl. Dip the chicken strips into the buffalo sauce and using your fingers scrape off the excess sauce. Place the dipped chicken in the bowl of Panko break crumbs and coat evenly. Carefully arrange the breaded chicken in your Airfryer basket. Cook at 300° for 20 minutes or the internal temperature of the chicken reaches 165°. Serve immediately. 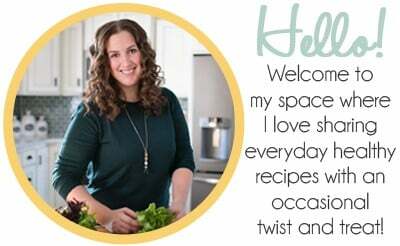 More healthy Air Fryer recipes! Monday dinner it is ! 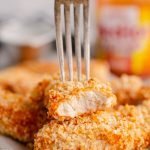 I’ve been wanting to try chicken tenders in my air fryer and these were delicious! Loved the extra kick! Couldn’t believe how delicious these were with only three ingredients! 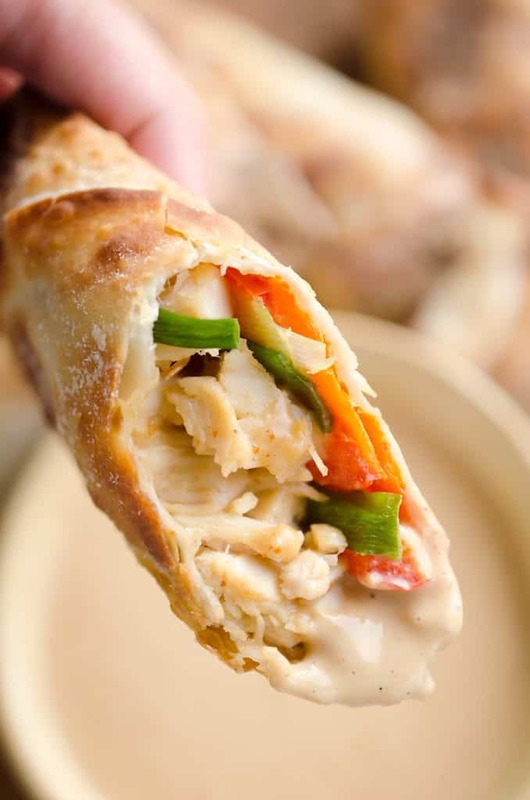 Love how easy this recipe is!! Thank you!